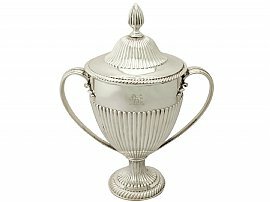 This magnificent antique George III sterling silver cup and cover has a bell shaped form to a spreading pedestal foot. The lower portion of this presentation cup is embellished with exceptional chased fluted ornamentation. The plain upper portion is embellished with a contemporary bright cut engraved crest of a lion passant to one side and a ship's sail fastened to its mast to the other. 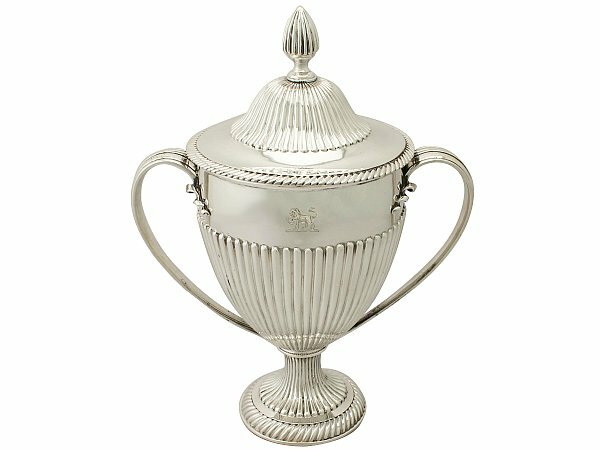 The cup retains the original hallmarked push fit domed cover encircled with further fluted decoration to the domed portion. This impressive cover is surmounted with an exceptional fluted sterling silver ovoid shaped finial. The rim of the cover is encompassed with an applied fluted decorated border, in a swirl design. The sleeve of the cover is further ornamented to either side with the aforementioned crests to the body. This imposing Georgian cup is fitted with two impressive elongated C shaped handles, each with bands of applied moulded ornamentation in addition to a birfucating spiralling upper terminal in junction with the body. This magnificent example of Georgian silverware is supported by a pedestal foot encompassed with further chased decoration; this ornamentation is identical to that of the cover. This cup is a superior gauge of silver and is the finest of its type you could hope to acquire. This antique silver presentation cup is a superior gauge of silver, exceptional quality and in exceptional condition. The chased decoration is all very sharp and the bright cut engraved crests are very crisp. Full hallmarks struck to the surface of the cup have wear in keeping with age and location; the maker's mark is worn. The full hallmarks to the sleeve of the cover are all very clear; these hallmarks are struck deeply due to the exceptional gauge of silver.